Plans to let schools set their term dates raise the possibility of summer holidays being cut in England. What might the consequences be? 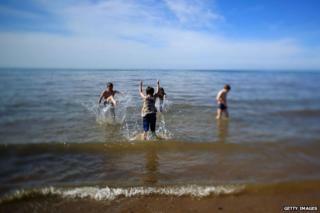 Splashing about in the paddling pool, picnics, hanging out with friends, bike rides, endless football, unlimited telly. For many this is the essence of the school summer holiday. A magical six-week break that beckons after a gruelling schedule of exams. Or an extended period of liberty without the restrictive rules and regulations of school. But from 2015, the six-week summer holiday may be a thing of the past. Schools in England are to be allowed to set their own term dates, under plans to give them more autonomy. But will there be knock-on effects? Many parents might be hoping for consequences that would save money. At the moment, holidays cost much more from mid-July to the end of August, because that is when families with children must take their breaks. People with no children can go at other times of year for less money. And the prospect of knocking two weeks off the summer and spreading it over the rest of the year would please many for whom it is not so much the cost of childcare as the logistics of keeping children entertained for a single six-week block. Of course, the actual effect on these two areas is not clear and there may be other notable consequences. While the possibility of summer holidays becoming slightly cheaper might be a tantalising one, for multiple-child families there could be a whole new logistical challenge. At the moment holidays tally, but what happens if the holiday dates differ? The prospect is not appealing, says one parent from Lancashire, who has one child in a primary school and another in a secondary academy. "It could be that the only holidays that coincide will be Christmas and Easter," says Richard. "Not many people go away at Christmas because if you want some sunshine you have to long-haul. "With the window of opportunity decreasing in the summer, many people might choose to take their main holiday at Easter. The holiday firms will end up doubling their prices. It's about supply and demand." How will children feel about having their lazy summer stolen from them? It's hard to imagine them being pleased at the prospect, but some experts say the idea of them having a long and enriching break at the moment is misguided. The Swallows and Amazons experience that many adults associate with their childhood simply doesn't exist today, says child psychologist Dr Pat Spungin. Youngsters don't have as much freedom as they used to, she says. And even in the countryside parents are more anxious than ever about children being out and about on their own. While people may argue that the long holiday encourages families to indulge in quality time together, fewer parents than before are able to devote the entire holiday to their children because of work commitments. "Of course children need downtime to be with their families, but six weeks is too long, Even parents who are not working send them off to their mates, or cricket, or summer camp - there is a lot of shunting too and fro," says Spungin. In reality, she says, most kids spend a lot of the holidays in front of the TV or computer screen. In the past few decades a huge industry has sprung up providing improving time-fillers, such as summer sports camps, art or acting courses. But these are out of the financial reach of many parents. The long holiday can be tough for some children who don't have that kind of stimulation, says Spungin. Image caption Michael Gove (left) - holiday snatcher? One of the most controversial factors in setting the length of the summer holiday is the debate over how much children can forget. "Summer camp is an American tradition dating back to the 19th Century, which lets boys and girls spend six weeks camping out under the stars, singing around the fire and learning valuable life skills." Those in favour of slashing the summer holiday cite research and anecdotal evidence from some teachers that children's learning regresses during the long break. In 2008, the Institute for Public Policy Research (IPPR) said studies suggested pupils' reading and maths abilities went backwards because the summer break was too long. Instead, the think-tank said the school year could have five eight-week terms, with a month off in the summer and two weeks between the rest of the terms. It said the dip in reading appeared to be largest for children from poorer homes. But Dennis Hayes, professor of education at the University of Derby, says that these arguments try to explain the children's lack of progress "in a technical way" and that shortening the summer holiday isn't the answer. "All children will continue reading through the summer if they are encouraged to do it at school," he argues. Local libraries will give them access to books. But he says many schools are failing the children by not instilling a love of learning in the first place. The roots of the long summer holiday go back to the UK's agricultural heritage, to a time when children had to help pick fruit and farm the land. Many argue that this is an outdated concept. But, while 70% of secondary schools and 30% of primary schools can already decide their own term and holiday dates - because they are either academies, free schools, foundation, voluntary-aided or faith schools - few actually choose to. One school that has changed its pattern is the David Young Community Academy. The secondary school in Leeds operates a seven-term year which starts in June, with the longest holiday being four weeks. The school's principal Ros McMullen says the benefits to the children are "huge". Children are taught in shorter blocks, with breaks in between. This means they are not as tired at the end of term as children in schools that stick to the traditional academic year, she says. Many overworked teachers desperate for the respite of the summer holiday are in favour of retaining the status quo. They point out that some countries in Europe with the highest level of academic achievement have longer summer breaks. Summer holidays in Sweden and Finland are typically about 10 or 11 weeks. In France, however, the government has proposed cutting "les grandes vacances" from its current two months in an attempt to raise standards. Marc Neesam, a primary school teacher working in London, says that although teachers appear to be getting long holidays compared with other professions, in reality some of that time is spent planning and preparing assessments. "In the summer, it takes about two weeks to switch off and two weeks to get ready for the new academic year. "You need to hit the ground running, you can't just turn up in September not knowing what you need to do," he says. Typically teachers will spend much of the Christmas and Easter holidays planning, says Neesam. "You don't really switch off in the smaller holidays." And he argues that children's lives are already getting too formalised. "Just because children are not in school, it doesn't mean they are not learning."